Parkland Health & Hospital System will raise the minimum wage of system entry-level workers to $10.25 an hour—and initially fund the boost from the bonus checks of executives. The Employee Relations Executive Compensation Committee at the Dallas-based system announced the plan Wednesday. 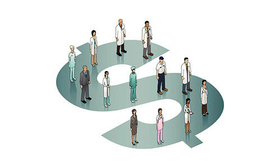 Dr. Jim Dunn, Parkland's executive vice president and chief talent officer, told Modern Healthcare the current minimum wage paid by Parkland is $8.78 an hour. The boost to $10.25 will put Parkland employees even further above the $7.25 minimum wage in Texas, the same as the federal rate. The plan, effective July 1, will cost $350,000 its first year and will affect about 230 employees who primarily work in environmental, linen and dietary services. “The overall increase is a part of a larger strategy on building around talent, and that's at both ends—executive and frontline,” Dunn said. The committee had been meeting to iron out a pay-for-performance compensation plan for Parkland's 60 vice presidents and top leaders. For the final quarter of the system's fiscal year—from July through September—executives could split from $750,000 to $1.2 million in incentive pay. Over the course of a full fiscal year, executives could share from $3 million to $5 million. The cost of the minimum wage hike will be covered from this upcoming quarter's bonuses, Dunn said. Parkland's board will evaluate four main areas when doling out executive incentives: quality, service, people and operations. Specifically, Dunn said measures include 30-day readmission rates, patient satisfaction scores and overall employee turnover, among others. Parkland, one of the largest safety net health systems in the country, has been going through a major overhaul of its administration after several years of turmoil. Dr. Fred Cerise, former secretary of Louisiana's health department, was named CEO this past winter. He inherited an organization that lacked a permanent CEO since August 2011 and nearly had its Medicare and Medicaid status revoked because of clinical quality and patient-safety issues. The minimum wage decision was part of the new leadership team's desire to improve employee morale and provide a better living wage to frontline staff, Dunn said. Employers that unilaterally raise the minimum wage they pay could be doing themselves a favor, in terms of employee retention, said Gary Burtless, a senior fellow of economic studies at the Brookings Institution. “There's a lot of evidence if you pay more than the minimum wage—if you lift your lowest wage—you obtain a better class of workers, and you have less turnover,” he said. Texas is one of 19 states with a minimum wage that is the same as the federal rate. President Barack Obama has pushed to increase the federal minimum wage to $10.10 but Congress is not going along. Several states, and some municipalities, have taken the matter into their own hands. Most recently, Vermont Gov. Peter Shumlin on Monday signed a bill that will increase that state's minimum wage from $8.73 to $10.50 an hour by 2018.